Rip Van Winkle, very sleepy after his 20 year snooze. 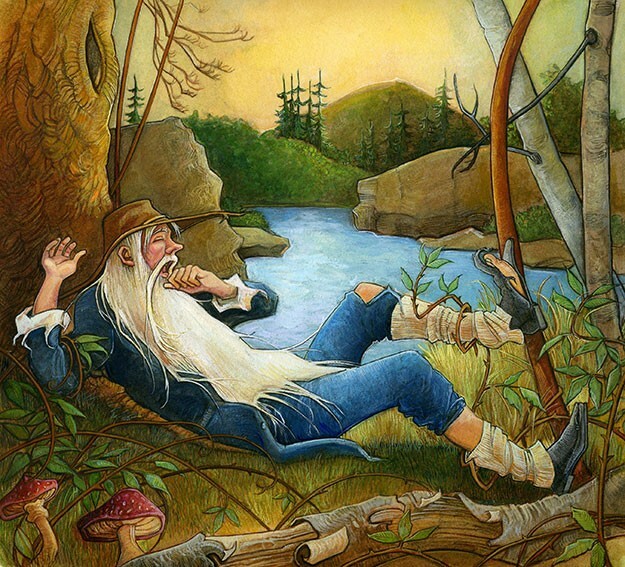 Gnomes of the Catskill Mountains put farmer Rip Van Winkle into a 20 year slumber. Michael Berkeley and Ray Roderick's Rip! The Musical comes to The CENTER for Performing Arts at Rhinebeck from July 17-19 with four performances to explore Rip's return home after his baffling absence. Revamped with a new script and score, Rip! zooms in on the delicate fibers of familial relationships and forgiveness alongside exuberant song, dance, and laughter. In Berkeley and Roderick's unremitting editing of their musical, several character evolutions have also taken place. Jarek Zabczynski stars as Rip Van Winkle, Lori Belter as Dame Van Winkle, and Lou Trapani as Peter Vanderdonk; the cast of 30 also includes Lisa Lynds, Michael Britt, Amy LeBlanc, Melissa Matthews, and Frank McGinnis. Berkeley noted that the issues addressed in Rip! The Musical remain relevant. “The idea of procrastination, couples disagreeing on the balance between fun and work, and the struggle with forgiving someone who has hurt us speaks to today's audiences,” he said. Visit RipTheMusical.com or call (845) 876-3080 for tickets.